Let’s talk about how you can increase your conversions, and let’s use an analogy – something simple. Let’s imagine that you own a retail store and a potential customer can walk up and look in the window. Now, if you have a website, and you don’t have a way for that person to opt-in (in other words, to give you their contact information) then they are essentially walking up and looking in the window to see if there is anything they like. And, if there is nothing that catches their eye, they’ll move on. Or, if they don’t really feel comfortable yet coming into the store or talking to anyone, they’ll move on. In the next case, let’s imaging that you do have something on your website. You offer them a free video, a free report or something in exchange for them giving you their contact information. And once you have their contact information, you can talk to them. That’s like someone coming into the store and filling out a registration card. You send them something in the mail every once in a while and maybe they come back and buy. But, maybe you don’t know what to send them so they don’t come back to your store. Still, it’s better than the first example. With marketing automation software, you essentially have a salesperson in your store who watches that person and sees what they are interested in. He sees which aisle they go down, which product they start staring at, what they pick up and hold. Now, imagine they are on your website. They go to a certain page. They watch a certain video. They click on a certain link. In the store, that salesperson would notice exactly what they are interested in and then start talking to them about that. In other words, his communication is going to be highly-relevant to what they want – to what they are interested in. They are going to be more likely to buy. 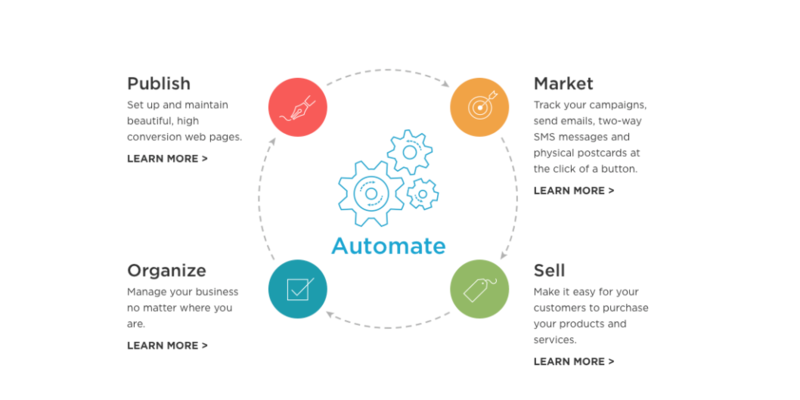 With marketing automation software, you can do the same thing on your website. You can see, for example, this person visited this page, looked at this video, and clicked on this link. And, you can even combine different factors to determine what to send them via email. This person looked at this page, and they clicked on this link and they clicked on this link in an email, so let’s send them this offer. Let’s send them something that is highly relevant to what they are interested in. And when you do that, what do you think is going to happen? Would you rather have someone driving up and looking in the windows of your business? Would you rather have them come in and send them offers that may or may not resonate? Or, would you rather be able to laser-target your communications and your offers to what they are doing? Well, marketing automation is how you can do that. If you want more leverage in your business, I invite you to apply for a strategy session where we can discuss your situation and whether or not marketing automation is one of the tools you can use to grow your business while freeing you up to work ON your business instead of in it.